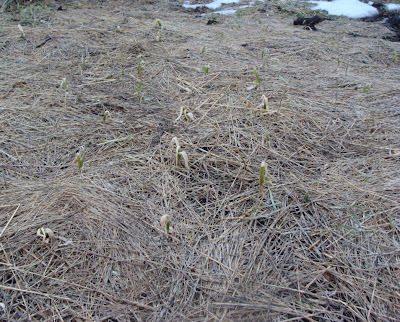 The garlic I planted in October is just visible again against its mulch of hay, now that the snow has melted. The shoots look a bit sad and sorry for themselves at the moment, but I hope they'll perk up a bit as the weather gets warmer. I'm sure they'll perk up; I hope so. I hope Winter is packing her bags, don't you? Hmmmm - it seems to me that there are usually a couple more snowfalls before the middle of April over your way! I suspect that mulch did just what it was supposed to. Thanks for visiting my cooking blog - double thanks really as I've really enjoyed reading your posts. I'm very envious of your raised beds in your greenhouse. They look lovely in the photographs and I'll bet they'll look even more scrumptious full of plants. As for garlic - it was too wet here in Pembrokeshire to plant it in October so I had to put mine into plugs in the polytunnel. They're nice strong plants now, I can't wait to see if they are better or worse than the usual way of planting them outside. Considering what they have had lying on top of them for months (snow not straw) I think they are doing very well. Lets hope you stay snow free from now on!